Reduced Price Residential Mobile Home For Sale In Benidorm. SOLD SOLD SOLD!! Stunning 3 Bedroom 2 Bathroom Aitana (double unit) Residential Mobile Home For Sale On Camping Almafra Caravan Park In Benidorm, Costa Blanca, Spain. One of the largest Homes available situated on a prime corner plot with stunning mountain views. The home is in immaculate condition and comes fully equipped with all modern fixtures and fittings as part of the sale. The large open living area comes complete with a 3 + 1 + 1 black leather sofa, media unit with flat screen TV & Sky Box, air conditioning unit & glass coffee table. The fully fitted Kitchen with breakfast bar is modern with all equipment included- Washing machine, electric Oven, Microwave & Fridge freezer. The first WC is equipped with toilet, shower cubicle, sink & vanity. The second WC is en-suite to the master bedroom with bath, toilet, sink & vanity unit. 2 double bedrooms and 1 single. The first double bedroom comes with double bed, fitted wardrobes, bedside cabinets, flat screen TV & ceiling fans. The en-suite master double comes with double bed, double width fitted wardrobes, bedside cabinets, Flat screen TV, dressing table with large mirror & ceiling fan. The third single bedroom comes with single bed, fitted wardrobes, computer desk & flat screen TV. To the front of the home is a large decked area with patio set & 4 chairs, sofa, 2 sun loungers, gas BBQ, Satellite dish & flat screen TV. The decked area is covered by an expensive awning, creating an extra space for relaxing outdoors. To the side of the home is a paved area with large shed and a parking space for 1 car. A viewing is highly recommended to appreciate how much is included in the sale! 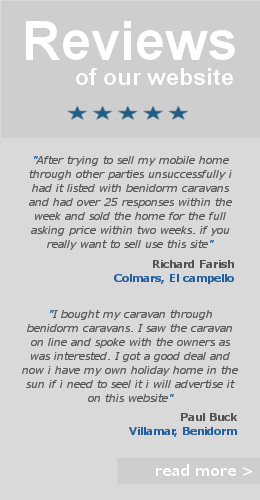 Aitana Residential Parkhomes Costa Blanca; Residential Mobile Home Sites Benidorm; Residential Caravan Parks Spain. 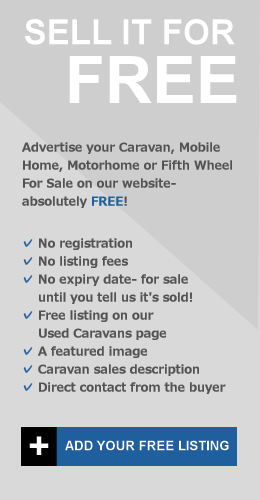 ← Hobby 1020 Prestige Touring Caravan & Awning For Sale In Benidorm €7,500.